Soft core belt to assist in holding silicone sheeting in place. Allows you to move in comfort, reduces pain and protects your incision. 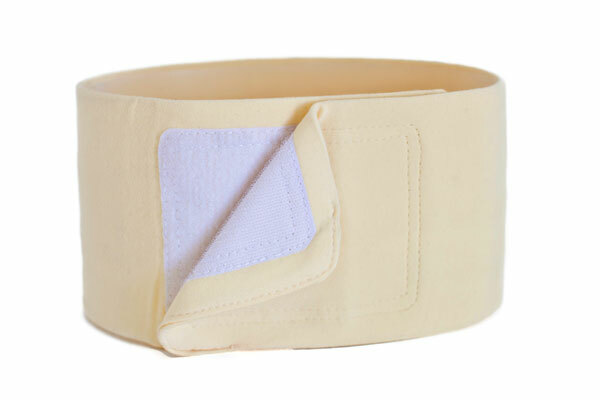 The 100% cotton covered elastic Hem It In Belt can be worn immediately after surgery. Wearing the binder keeps your silicone sheet in place and protects your incision. The Hem-It-In Belt includes a 6 inch Velcro closure attachment pad. Soft cotton covers our elastic, so it�s comfortable and cool. Great for wearing under clothing, for the discreet support needed as you heal your scarring. 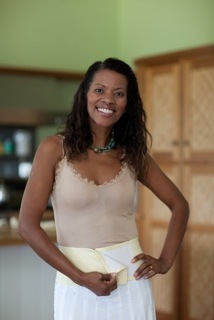 For support of silicone sheeting after tummy tuck , c-section or any other abdominal surgery. *Measure around your belly; 2� below your belly button at 8th-9th Month of pregnancy. The chart above is based on an average height of 5'6". Please adjust to your needs. At 9th months Subtract 3-5� for POST Birth Guesstimate of size. Pregnancy Support sizing guideline: When 7or 8 months pregnant, consider that you will be growing by 3 to 5 inches until your 8th and 9th month. Take your measurement 2 inches below your belly button around the buttocks area, not up at the waist. Note: Please be aware that your bikini belt may stretch while being worn during pregnancy. Continue using the belt after delivery, whether vaginally or by caesarean. If you need to shrink the Recovery belt (not the Support Strap) wash in hot water, and/ or dry on high if you need further shrinkage. The best support immediately after a vaginal birth is with our Hem-It-In Belt which has a stronger inner elastic system. This belt may also be used for additional support 3 weeks after a C-Section. The best time to measure is while you are 9 months pregnant, and If you�re very close to your due date, a general guideline to follow is; all around body measure at 2" below belly button-subtract 3 to 5 inches (8cm-13cm) from your belly measurement, during 9th month. Unscheduled C-Section sizing guideline: If you find yourself needing our C-Section Bikini Belt for an unplanned caesarean, simply measure around your tummy; 2 inches (5cm) below your belly button. Your Recovery belt is designed with 6 to 9 inches of adjustability to help you transition through your recovery and back to your unique pre-pregnancy shape. Weight, Height and type of body (larger hips vs breasts) Must be taken into account.